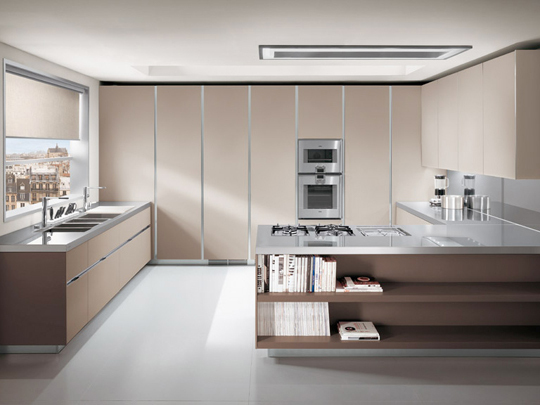 Solid Surface Kitchen Tops - What Type Of Solid Surface For Your Kitchen? Solid Surface Kitchen Tops – What Type Of Solid Surface For Your Kitchen? Home / Solid Surface Kitchen Tops – What Type Of Solid Surface For Your Kitchen? Solid Surface Kitchen Table Top – What Type Of Solid Surface For Your Kitchen? For solid surface kitchen table tops or countertops. It’s made of polyester resin and can be tinted on different colors and designs. It can be molded to different sizes and can fit any kitchen. The solid surface kitchen table top is one of the most preferred by many homeowners because it’s not as expensive as the granite surface kitchen table top but it can look just like granite. It is a solid surface which means that there are no lines and edges where moulds, mildew and any sort of bacteria can thrive. Nowadays solid surface do have made of acrylic like Samsung Staron. 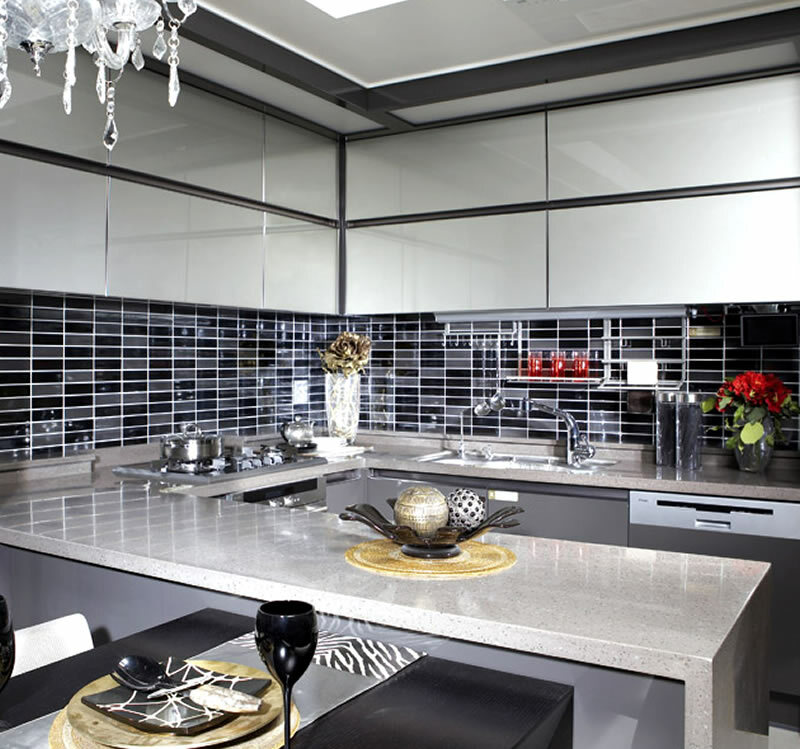 If not you can consider Granite Kitchen Tops or else can consider Quartz kitchen tops too. The solid surface kitchen table top is very easy to clean and maintain. Just make sure you wipe it clean before using just to get rid of the dirt that can cover the table top. That’s all the maintenance you really need to do on a daily basis to ensure that your food won’t be contaminated. If you happen to scratch the surface of your table top, you just need a sand paper to fix it and it’s offered with a warranty of about 10 years. 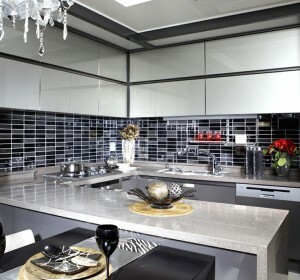 When you prefer the solid surface kitchen table top you must also know that it is not perfect as it can’t stand heat. If your table top in your kitchen is Corian, make sure you don’t place anything really hot on top of it ‘cos it can damage it. It is made of polymer and resin mixture and those are strong and sturdy but react with high temperature. It’s been around for decades and continues to be one of the most preferred materials for table tops. That’s because it can be designed however you want with the colors you want and it just does not go out of fashion. If you want your table top to blend in with your kitchen then you can use colors that complement the color in your kitchen. 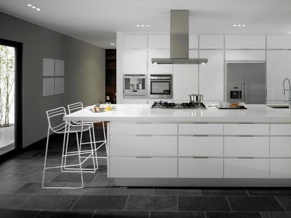 You can also choose colors that will act as accents to the color of your entire kitchen. There are different types of solid surface kitchen table top and price has a wide range. The basic colored ones are priced less than the ones that are made to look like granite or with intricate designs. What is common for each one is the quality that can last for over a decade if cared for well. It requires low maintenance only so there won’t be a problem taking care of your kitchen table top. It is strong but do take note that it can’t handle extreme beating like granite can because granites are made of the toughest stones while solid surface is made of acrylic. Do a bit of research first before deciding on the type of solid surface kitchen table top you want and if it is the best choice for you.